Strike gold with Donna Karan's Vapor European sham. Featuring a sophisticated burnout pattern, this sham is as soft and inviting as it is stylish thanks to its viscose-silk blend face and cotton sateen reverse side. Reverse: 300-thread count cotton sateen. EXCLUSIVELY AT NEIMAN MARCUS Quilted sham in metallic spots pattern. Self flange. Unquilted back. Zip closure. Cotton/viscose. Machine wash. 26"Sq. 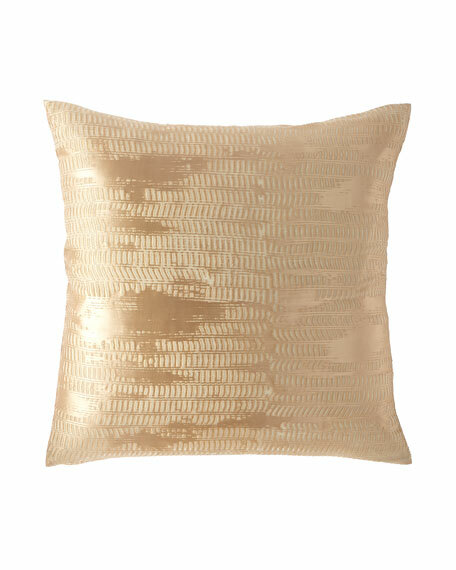 EXCLUSIVELY AT NEIMAN MARCUS Quilted sham in metallic spots pattern. Self flange. Unquilted back. Zip closure. Cotton/viscose. Machine wash. 26"Sq. Imported.